For many years, there has been a project to measure the effects of the water level of Mono Lake on the breeding gull population. The primary breeding site for the California Gull (CAGU) is on the islands of Mono Lake. Fluctuating water levels have changed the size of the islands used for nesting, have changed the salinity of the water and the resulting food available to the gull. Since 1983, nest counts, off-spring counts, banding and mortality counts have been done on the islands. I was invited to participate this year. I was given a couple of warnings: gulls attack and kill their own and nearby nesting babies; they poop and throw-up on the handler; there is a possibility of being stranded temporarily on the islands by wind; it’s hard work; it can be very hot. Only the last warning gave me pause. Fortunately for me, the temperature this year was comfortable. I met up with the group leader, Kristie Nelson, and her assistant, Ann Greiner. Kristie arrived with her truck full of supplies, trailing a rowboat with an outboard. We off loaded the supplies to the boat. Looking at the pile of supplies for 6 people for 3 1/2 days, never did I think it would fit on the boat! Ann and Kristie climbed on and took the supplies out to the island. I went to another location to be picked up 3 hours later along with the rest of the crew. Our field station is on Krakatoa Island, once a movie set for the 1953 movie, “Fair Wind to Java”. The field station is a fake volcano built for the movie. A platform has been added halfway up the in the inside of the ‘volcano’. A storage room, cooking station, washing station, storage shelves, benches have been added. We set out sleeping bags along the outside edge of the platform. To get to the platform requires a climb up the volcanic rock, about 50 feet up from the shoreline. All the gear gets carried up and down the rough path up to the field station from the boat. The other 4 crew members met up at Mono County Park and carpooled down the road to a parking area. From there, we had a 1/2 mile walk to the water’s edge where Kristie picked us up in the boat. She maneuvered through the tufa towers above and below the water’s surface, slowly moving the boat backwards to the open water. A halfhour ride brought it to our island. Our gear had been off loaded to the shore. We carried supplies up to the ‘volcano’ platform and settled in for lunch and the afternoon break. The work schedule is set for early mornings and late afternoon/evening, to avoid the worst heat of the day. It’s stressful for both the birds and for us to be working in the heat so we work when it’s cooler. We get up before dawn, start the water for coffee and tea and while we’re watching the sunrise and drinking our morning tea, we make our breakfast. We were in the boat between 7 and 7:30. The nearest island is only a few minutes away across the straight. The farthest is about 35 minutes away. Paoha is the largest of the Mono Lake islands and has four banding plots. Other islands are on the Negit Island chain and consist of Twain (4 plots with 40% of the nesting colony), Little Tahiti (3 plots), and Little Norway with one plot. A total of 754 chicks were banded this year. We walked from the boat to the plots in single-file to minimize the disruption to the nesting gulls. There are 20,000 nests on the islands, each about 2 feet apart so everywhere you step you are walking around a nest. When we got to the plot, we set down the gear and erected baby playpen sections to form a corral. We moved in a line from the far side of the plot to corral the babies into the pen. Each of us carried a large or small box or milk crate. If a gull chick tried to get past us, we picked it up and placed it in a box. The smallest chicks were left in place with a box or crate placed over them. They would be banded last. The older chicks find their way back to their nests when they are released after being banded. We set ourselves in a rough circle near the pens. Large cardboard boxes were placed by each of the three banders and chicks were placed inside for easy reach by the banders. A recorder and a weigher sat nearby. The handlers moved the chicks from the pens to the boxes, keeping the chicks from piling on each other, keeping the boxes full and moving out empty boxes and replacing them with full boxes. When the FWS band was placed, the blue color band was put on. In almost all cases, the blue band was placed above the FWS band. For the tiniest chicks whose tarsus were too short for both bands, the color band was placed on the opposite leg. For consistency, most FWS bands were placed on the left leg with the color band above it. We saw and were able to read FWS bands of 5 adults in the plots. Those will be called in to the FWS Banding Laboratory as a report on the current status of those birds. When we were nearly done with the largest of the chicks, the handlers would pick up the tiny chicks, leaving the boxes in place as markers of the nest location. These babies were placed back under the box and the box would be removed only when we were ready to leave. The youngest and weakest of the babies are attacked by other babies and by adults as they move through the territories on their way back to their nests. This method of keeping the littlest chicks in place cuts down on the pecking and possibility of death for the tiny ones. Chicks averaged about 400 gms, but we had one of 45 gms and one of 770 gms. The largest one took off when we finished with it and flew over the fence. We got pooped on, thrown-up on; pecked. One adult threw up a piece of skin (probably fish skin) about 8 inches long and 4 inches wide, taking at least 5 minutes to get it up completely. We all stopped what we were doing to watch. Adult gulls regurgitate their food to feed their chicks, but this piece was too large for any adult or chick to manage. When we returned to our island for lunch, we washed up and changed into clean clothes and had lunch. Lunch was most often sandwiches of tomato, fresh goat cheese, cucumbers, mayonnaise (despite repeat jokes of ‘gullonnaise’). We would play cards and read and talk and knit and nap. One afternoon we took feathers from a dead gull and toss them into the air off the rocks of our island. A half dozen violet-green swallows flew around catching feathers to line their nests. I tried to catch the aerial ballet of the swallows with my camera and was not altogether successful. Swallows nested in the crevices of the tufa. Eared grebes sailed by. A prairie falcon visited a couple of the islands. A golden eagle came by and the gulls all left their nests. One night in full dark, we heard the gulls crying and flying and guessed they were being visited by great horned owls. At one plot where we expected few to no nests because of an invasion of ticks, we found one recently dead gull chick. The blood was fresh and red, the inner organs not yet eaten. We must have disturbed the predator in the act of starting to eat a very recent kill. We suspected it was the prairie falcon. The food was plentiful and excellent, mostly vegetarian with the fresh goat cheese. The company was interesting, intelligent, informative and fun. We woke before dawn and fell asleep shortly after the sun set, and slept well. It was no hardship waking up before sunrise–dawn was beautiful every morning and sunsets were spectacular. Yes, I would do it again. As we headed down the trail from the parking area toward the prairie falcon nest area around 10 am , we could see a large falcon on top of the rock outcropping where last year’s eyrie was. She flew and by the time we walked out there, we saw nothing. So we set up our scopes and scanned the outcroppings and trees, and waited. At 11:11 we saw the male in a hole on the left slope of the backside of the eyrie. We hadn’t seen him fly in. He had a very full crop so we thought maybe he’d been deeper in the hole eating. We heard wailing at 11:24. The male dropped down into the hole out of sight. A minute late, wailing, he came out, flew straight down. The falcon appeared from below him and flew to the top of a rock to the right of the eyrie. He followed, landed on her and they copulated. She stayed on the rock and he flew somewhere behind it, out of sight. We could hear both of them wailing periodically. We left at noon and headed out to the peregrine eyrie. We were walking down the trail and saw a peregrine flying from the ridge on the opposite side of the canyon toward the Climbing Rock area. We lost sight of it as it flew low over the trees. We set up in the meadow below the nest cave and scanned everything, seeing and hearing nothing. At 3:45 we heard wailing from behind us at the top of the ridge in the trees. At 3:55, again we heard wailing and from behind us the falcon came flying in. From the north we saw the tiercel also flying in. He landed in the nest cave and she landed on top of the nest rock. At 4:14, he flew out of the cave, circled and landed on the falcon, copulating, with a lot of e-chupping from both. He flew back to the nest cave. They continued to wail and e-chup. At 4:20, the falcon flew from the rock top to the area behind Castle Rock. A minute later, she had circled around and was flying in from the south. She landed out of our sight but we could hear her. As we walked out, we heard a great horned owl calling from the trees on the ridge opposite the nest cave. Hope it has plenty to eat and leaves the eyases alone. There is some new graffiti on the rocks in the area of Climbing Rock, but not in the area of the nest cave. Inside one of the caves in Pyramid Rock, there is some new graffiti, carved into the rock. It looks like both pairs are well on their way to a nesting season. I went out to the peregrine nest site today. Claire was here from the UK so I took her out to see the canyon. We got there around 9:30. It was cold when we got there but we warmed up walking in. The canyon was in sun and it was comfortable enough that I took off my coat to sit on. (I didn’t have Cheryl along so didn’t have her curtains to sit on–I’m just not as organized as Cheryl). Ms X was in the smaller hole above and to the right of the largest cave. At 9:50, the tiercel flew in with some food for her. They both flew off and sailed around for a short time. She seems to have her own favorite perches, different from the past falcon’s old favorites and different from the tiercel’s. She went to the front face of Pyramid Rock, flew to an area to the left of the cliff face. We saw a turkey vulture jump as she sailed by wailing. For a long time I could hear her but couldn’t see her. Then she flew past the TV again, back again, and I found her in a small hole in a rock to the left of the outcrop where the horizontal crack is. 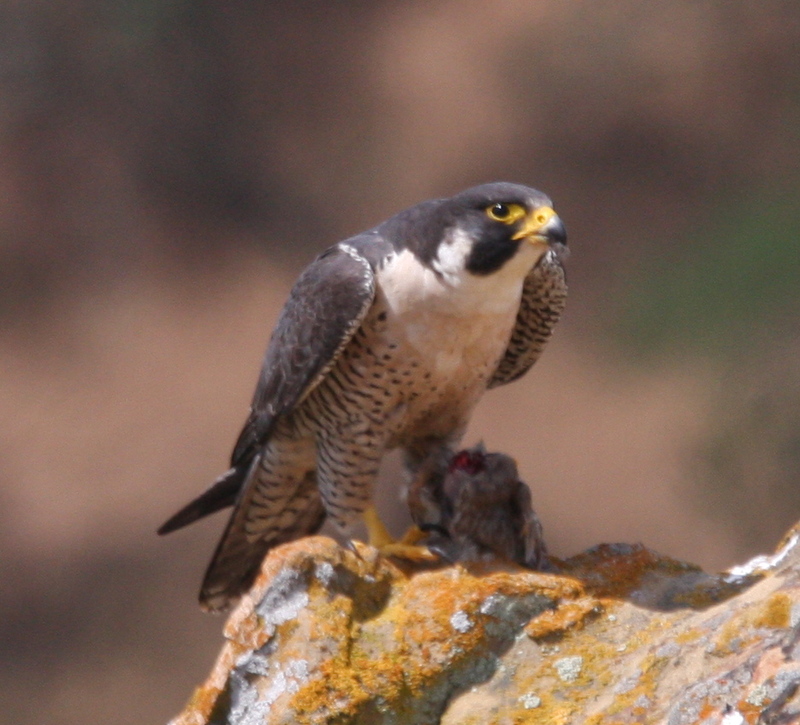 She flew up to the left edge of that rock, took the bird that the tiercel had brought for her and plucked and ate it. The tiercel was sitting in the spot the falcon had been in when we first got there. Ms X finished eating and flew to the nest cave. From there, she flew out of sight between Pyramid and the nest cave. We could hear her. 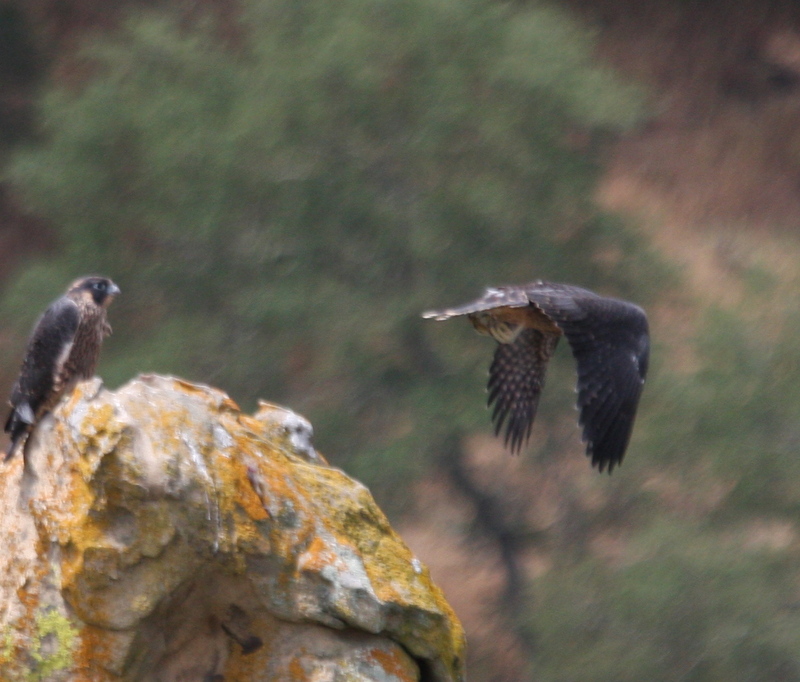 They both flew around, landing in the nest cave, then out again and off to the area behind the ridge. Claire and I went for a walk down the trail. We saw them flying around once while we were walking. We turned back, passing the nest area, not seeing the peregrines. We said goodbye to them and left. We saw three redtails in the area between the swimming pool and the parking lot, an acorn woodpecker near the rest room. The usual turkey vultures were around. No coyotes today. We took the North Road into the Park and stopped many times to look at the 30 or so redtails. We saw a beautiful chocolate colored dark morph. There was a pair doing some talon-linked sky dancing. We left the park on the South Road. As we were making our way down to the freeway, a red shoulder flew out of the trees and landed on a traffic sign just at the edge of the road in front of us. I pulled as far off the road as I could, put on my flashers and we sat and watched the redshoulder. Beautiful bird and only about 15 feet in front of the car. We got home after 3 pm. Kanit, Cheryl, Joy and I went to the canyon at Sensitive Site #1 on Sunday, 11/30/08. We got a ride into the canyon with the ranger on an open-backed 4 wheel drive vehicle. Joy and I in the front could hear Kanit and Cheryl in the outside squealing periodically as we got very close to the trail’s edge. The ranger drove us to our meadow and we piled out, Kanit and Cheryl saying it had been like a fun amusement park ride. The ranger had not seen the peregrines so she stayed with us while we set up our scopes. Almost immediately, both birds took off flying, then one settled into a hole in the rock. We got a scope on her. It was apparent that this was not the usual male and not the usual female. This one had a full dark hood, yellow talons, pale cere. The male of the usual pair is 12.5 and has dark orange talons and an orange cere. The female of the pair has malar stripes. After a brief discussion about the possibility of losing color in a few months (we decided that wasn’t possible) we noticed bands on the legs of this bird. The VID band is on the left while the male’s VID band is on the right. The usual female of the pair is not banded. From the distance of the canyon floor to the cliff face, it’s not possible to read a band. We didn’t get a clear look at the other bird to confirm band or talon color or any markings. At 11:30 we decided to head for the ridge top. A 30 minute walk out of the canyon, a 20 minute drive, a 45 minute hike to the ridge and we set up our scopes. An hour later, both birds were in the air flying, the female going after a turkey vulture, hitting it several times. She returned and settled on the top of the nest rock and all 4 scopes turned on her. She showed us only the bottom letter of the band (Z). Three of the 4 of us that saw the band agreed on the letter (I didn’t get the band in my scope, being behind bushes that obscured the view and not wanting to move too much, especially knowing there were clear views from the other scopes). She flew and we left shortly after that with a job to do. I went back on 12/2 and immediately saw the male. This time I was able to get a clear look at him—orange talons, orange cere, pale grey back. A short flight and a landing on another outcrop and I was able to read his band and confirm him the same male as previously at the nest site. He flew again and landed on top of the nest rock. In all, he stayed in sight for more than 2 hours. 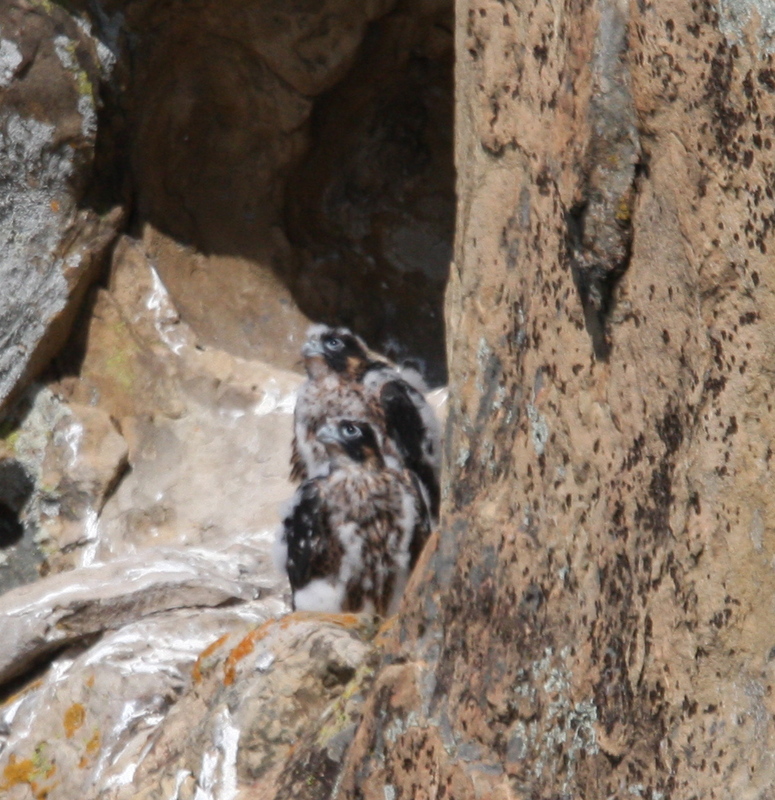 He took off from the nest rock and dove into the canyon, then started a trans-canyon ledge display. Flying the 1/4 mile of the canyon, LOUDLY e-chupping (a constant one-word e-chup e-chup e-chupe-chup e-chup e-chup e-chup e-chup the length of the canyon—a territorial e-chup. I heard his e-chup change to a cakcakcak and heard another bird scream as he hit it or came close—he was out of my sight at that time. He flew off and I left. On 12/7, Cheryl and I went back to the canyon ridge, spotting a coyote on the road behind the car. He headed up the hill off trail while we followed on trail. He was much faster than we were. It was wonderfully foggy, clearing intermittently. Except for one brief sighting of a peregrine and one brief sighting of a golden eagle, we saw nothing. We moved down into the canyon and again saw no peregrines. We left cold, tired and disappointed. On 12/9, I headed out again. When I was getting my gear out of the car I heard and then saw an acorn woodpecker pecking away but got distracted by a pair of western bluebirds pecking at the window of my car. The female was sitting 2 feet away from me on a barbed wire fence and the male was trying to chase off its reflection in the window of my car. Some play, some copulation, some coughing up of a pellet (the birds), and then I headed up the trail. 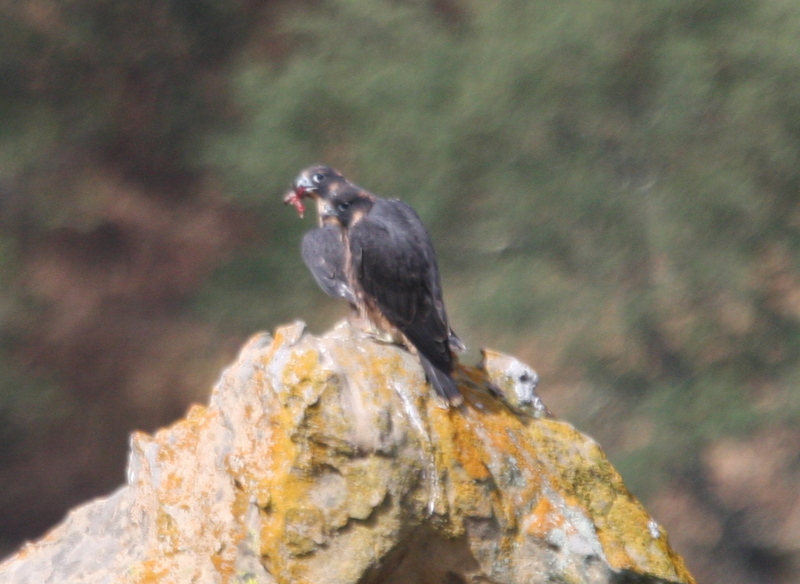 The tiercel was on one of his favorite rock outcroppings. He stayed for about 10 minutes, then left. I could hear him on the rock race e-chupping occasionally. At 10:30, from across the canyon I could hear wailing. With very little chance of spotting anything at 1/3 mile, I turned my scope in the direction of the wailing and spotted a peregrine shape in a tree on the opposite ridge. Lucky find. I didn’t notice until a few minutes later that there was a second peregrine in the same tree, just a little to the left of the first one I spotted. They sat there for 2 1/2 hours while I watched. At 1pm they both flew, chasing a pair of redtails and a pair of turkey vultures. They flew to my side of the canyon but the sun was in my face and I didn’t get a clear enough view to see if there were bands on the bird and certainly had no chance to read it. Neither one settled down to stay. I left around 2 pm, spotting a sharpshinned hawk flying over the trail, landing on a branch in front of me, then leaving again. And again a coyote, this time on the trail behind me. The bluebirds were gone when I got back to the car having left some whitewash behind. Four trips to the canyon ridge in 1 1/2 weeks. It’s getting too close to the solstice and the start of pair bonding so I won’t be heading back up there. Maybe a reading with a telescope will be possible. I did head up again, this time on 12/16. It was raining steadily and muddy all the way up. The usual 40-45 minute hike up took 50 minutes. On the ridge trail about 20 feet in front of me, I spotted a coyote before it heard me. When it noticed, it took off up the trail at a run. I didn’t see it again but I’m sure it moved off the trail a bit ahead of me and watched as I passed it. When I got to the nest area, nothing was in sight. It was still raining but the climb had warmed me well. I took off my gloves and set up the scope to be ready. I should have brought an umbrella to keep the rain off. I heard two different sets of e-chups and watched as a peregrine took off from the rock face, circle around once and fly back into the nest cave. After an hour, the clouds cleared, the sun came out. With rain still around, there was a rainbow northwest of the cave. A out came a peregrine, again flying around. This time it landed on Sentinel Rock. Immediately, it was clear this was not the 12 year old male (this one did not have the orange talons of the old male). I had the scope on it and saw a peregrine with a bright yellow cere, yellow talons and thick malar stripes. Not the banded bird we had seen last week? It stretched out the left leg to scratch its head and I couldn’t see a band. It was e-chupping nearly constantly with a high pitched e-chup, looking around. After about 10 minutes it turned around, pooped, showed me two bare legs as it flew away. 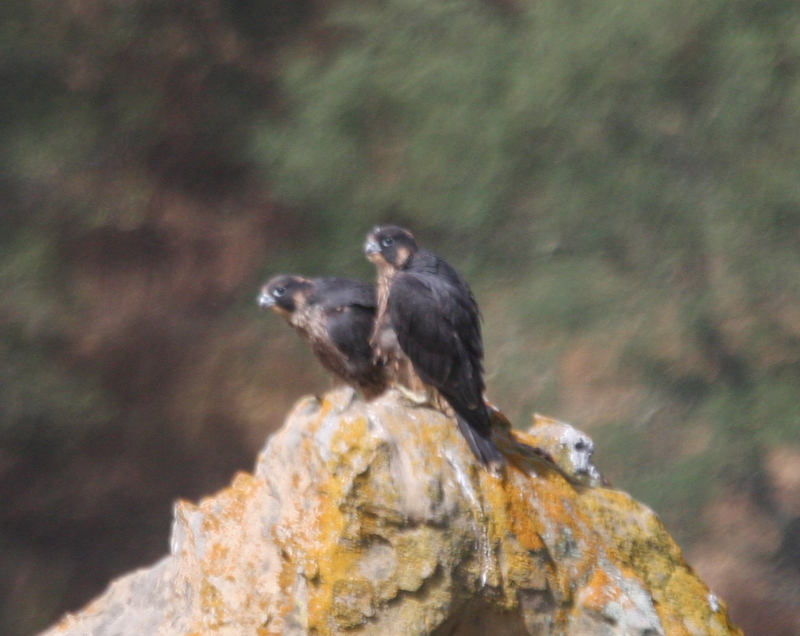 So we have a 4th peregrine in the territory. I’m not sure if this is common in a territory in the non-breeding season when there is a full complement of adult birds. More questions to answer. I’m a little afraid to go back and find another new bird. I did hear two peregrines today but saw only the one. It was small enough that it could have been a male and with the higher pitched voice, it’s possible. I went to the nest site the back way. When I got there, the adult female was on top of the nest cave. One fledgling was on the top of Pyramid Rock. I’d been hearing baby wailing for the last 1/4 mile of my walk there, so found it easily. The other was nowhere to be seen or heard. The adult male brought food to the one, put both feet down on the rock top, dropped food and immediately stepped off. The food fell and the baby wailed…. for five minutes. The falcon left the nest rock and headed out into the canyon and came back a minute later and gave the fledgling a bird. He plucked it and ate it. And after he finished, the other fledgling landed on the side of Pyramid and after a rest, scrambled to the top and ate. They sat together, one lay down, they ‘beaked’ each other, one poked and plucked at the others feathers. Then after an hour, the same fledgling who flew earlier stepped off the side and flew to a rock directly in front of the nest cave. Another bird was delivered to Pyramid, and the fledgling flew back to share again. 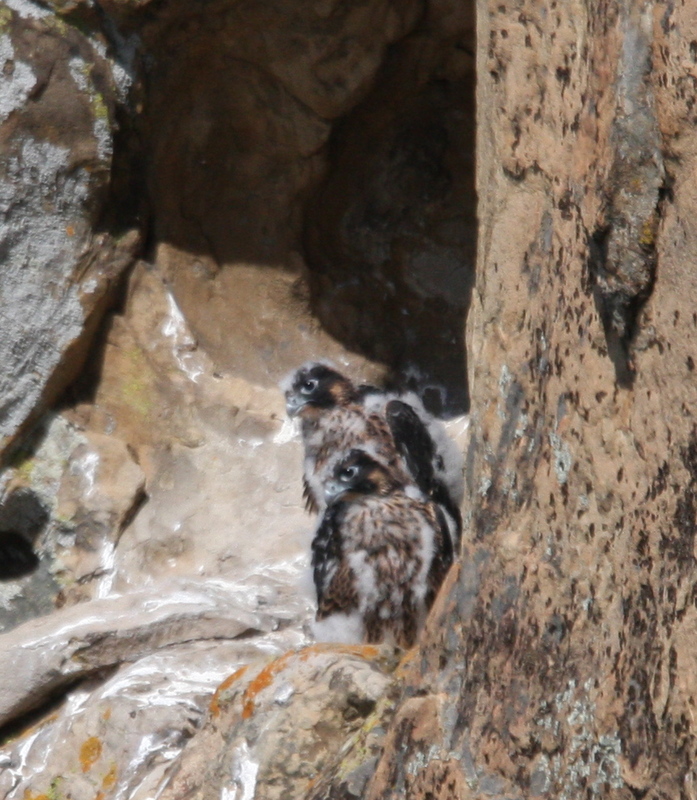 The same fledgling later flew to the same rock in front of the nest cave, and back again. He later flew to the top of the nest cave rock, where he was when I left. So, one flying well. One seems to have just fledged and is sitting and waiting for awhile to try again. I’m guessing one fledged 6/2/08 and one this morning 6/3/08. Two males. Today is day 39-40 since hatch. I went up the back side of the cliff nest scrape with my bird blind. the other, but possibly the other had already eaten. We’ve seen that several times that they alternate eating. cakking somewhere near the nest scrape when I left.